Now that my eye has been readjusted I’m seeing Irish martingales everywhere. Two in the first race of the day, on Placement and Fine Calibre. And at last, a half decent photo. When they appear so obvious it makes you wonder how I’ve missed them all this time, but then I tend to be looking at the whole animal and other particular bits of gear rather than the reins. And it’s easy to see how easy they are to miss. There are all those hands, belts, bands, rings, straps and buckles. 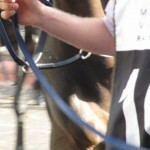 You can try for yourself in my spot the martingale photos! Only two bets for the day. Follonica because of those fabulous ear muffs and there was a gale force northerly wind blowing. Horses hate the wind whistling in their ears, and I do too. It creates havoc with my tinnitus. So I suppose it was some sort of sympathy bet. 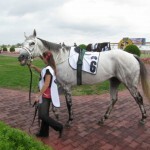 But the muffs didn’t help and Follonica finished fourth of six. And I backed a beautiful Amah Rock, for another fourth. Next start it. But a wretched losing day. My first for some time. I put it down to the wind. I have trained my eye to instantly assess a horse for over a hundred different variables, mostly related to behaviour and gear. But there are still things that I miss. Fortunately I can rely on other eyes, and when my mate Peter said have you seen the Irish martingale on Fabulist, I had to confess that I had missed it. 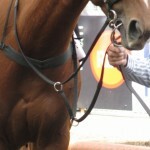 I whipped out the camera for a quick snap of the horses head, just hoping to catch it. I’m afraid I failed pretty comprehensively. But if you have a good look at the picture you can get a glimpse of the rings on the reins in the bottom right-hand corner. 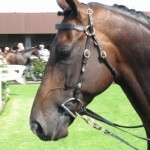 An Irish martingale is simply a short strap with a ring on either end. The reins are run through the ring on each side. According to Wikipedia “the Irish martingale’s purpose is not to control the head, but to prevent the reins from coming over the horse’s head, risking entanglement, should a rider fall”. 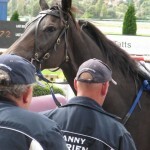 This seemed like a bit of nonsense so after the race I hurried back to the stall to check with Danny O’Brien. Danny said that the rings just put a bit of weight on the reins and get the horse’s head down a bit. He also said they are often used in track gallops. I could see why Fabulist could benefit because the mare was very much a head-up, unsettled type of horse. 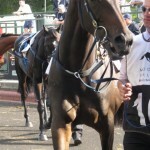 But to no avail though, when the horse finished fourth of seven runners. Not much else caught my eye. Stanzout, who used to be a beautiful dappled grey is now almost completely white, but retaining the dapples on his legs, front and back. 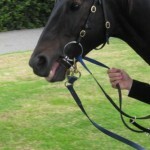 If you do a search for Stanzout in the Search box you can see how he looked on Cox Plate day in 2010. Age gets to us all. I’ve even found a few white hairs in unmentionable places as well. And God Has Spoken was sporting very spiffy yellow winkers. I can’t recall seeing this colour on a horse before, but it is probably appropriate. Horses have what is known as dichromatic colour vision, in contrast to humans who have trichromatic vision. Horses can see blue and yellow, but not red and green. They probably perceive the world in much the same way as a red-green colour blind human. God Has Spoken finished eleventh of fourteen. He was obviously too distracted by a colour that he could actually see out of the corner of his eye. 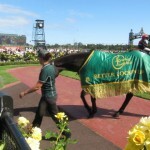 I always say that I’m not having a bet on the Newmarket Handicap because it is such a hard race. Twenty four horses down the straight six. The Charge of the Light Brigade. But each year I see something and get sucked right in, usually to my personal financial disadvantage. And this year is no different. I’m not betting. Until suddenly, what on earth is that? A horse in a full body suit, a ginormous wet suit, an equine budgie smuggler! And look. I think it’s Hay List, the favourite for the Newmarket, but I can’t be sure. 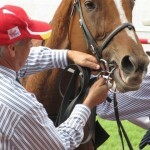 The tag on the bridle is slightly obscured. Is it Race 6, No 1, or is it No 11. The horse disappears before I can confirm its identity. This is the first time I’ve seen a compression suit. Apparently they increase circulation to the muscles during transportation and stabling. Wow! For more information check out the Hidez website. 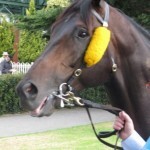 I’m all set to back Hay List until he fronts up in the mounting yard with winkers. Now, I’ve developed a slight aversion to winkers, not as bad as the nose roll, but enough to put me off backing horses sporting them. What a shame, when I was all set to fall in love with compression suits. Anyway, it must have been the 11, Grand Nirvana. But hey. What’s that? Buffering. Lobbing along, head down, relaxed, stunning. A standout. And who’s that? Another standout. A Francesca sighting. It is an omen. All the planets are aligning. I back Buffering for the place. They’re off and Buffering has the race shot to bits, until who is that digging deep on the line? Of course, it is that grand warrior, Hay List. Have the budgie smugglers done the job? But I’m not fussed, because the $5.90 place divvy for Buffering is the same regardless of first or second. No bet on the Australian Cup. 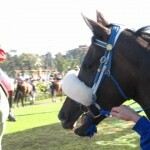 But I did glimpse the fine head on Americain. 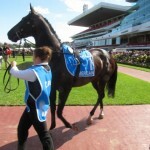 The horse looked magnificent. You can only describe him as imposing. I also caught a brief glimpse of Better Loosen Up who won the race in 1991. Can you believe this horse is 26 going on 27 years old. I wish I could see him without the rug. 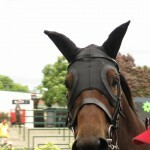 And in the last Yosie had an interesting gear combo of Kineton nose band, nose roll and tongue tie. There was meant to be a bit lifter in there somewhere but with all those straps and buckles I’m blowed if I could see it. Yosei finished a respectable fifth. A soggy race book. Too wet to bet.